If you want fast loading website/blog, you should consider using WordPress as the Content Management System. WordPress could be used to create webpages with smaller file size and efficient compression. 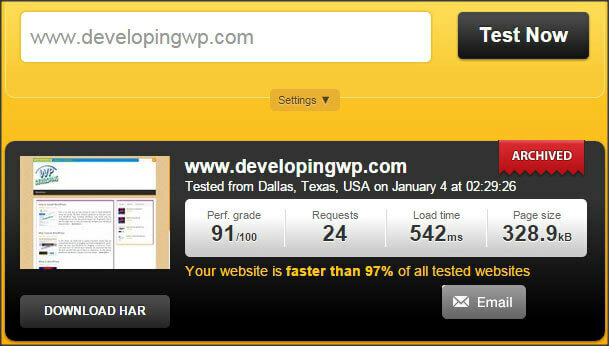 With simple and optimized programming codes, WP will make any sites run faster. WP has built-in Auto Update which is useful for security and efficiency. By using WordPress, it is so easy to create post or custom pages. WP require less time to be managed and has simple interface. It is very use to learn and use it. There are popular and elegant themes which could be used as template to design awesome website. We could make our site having two or more widget and place it on left or right section. Or, we could make it widget-less. Anything is possible with WordPress. To build beautiful and Elegant WordPress Website, we should design our own themes with simple and optimized codes. Then, we should customize it to make it as good as possible. If you couldn’t design a theme, don’t be sad. There are online shop which sell themes such as ThemeForest, WooThemes, Envato, StudioPress, iThemes Builder and Templatic. Static HTML files are good for speed but it would cause big trouble if there are hundreds or even thousands of pages which require editing. It would be very good idea to migrate from plain static HTML to WordPress. WP will make it easier to update thousand or even million of post. Basically, WP able to do as what plain HTML do plus there are lots of awesome features which we can use to enhance the site. If you require advanced features such as spam filtering, showing ads for certain visitors, display latest post in any places, send notification for visitor and much more, you could use WordPress to make it come true. WP has built-in advanced features plus there are so many plugins which offer additional features. WP is already optimized for both visitor and Search Engine. It has simple and smart structure which make it easy for any bots to learn and get the content of any WordPress site. Bots and Visitors would be able to explore the site easily by using well-designed navigation system. By using SEO-Friendly CMS, there is high chance to get better ranking in Search Engine Ranking Position. WP require less memory and processor usage if configured correctly. It use low resources due to small amount of Queries call to database while creating posts or pages and cache it for another usages. WP also has hot-linking prevention which is useful to save bandwidth. navigate to WordPress Definition to learn more. Security is always the first concern for any webmaster. WP has built-in Defensive mechanism to secure the site plus there are plugins which offer security and protection. We could scan the whole site and keep it virus-free by installing certain plugins. Spam has become severe problem for any website owner. Not only it make the site looks ugly, the site could be sand-boxed by any Search Engine. Most spammer using automatic tools which capable to request lots of pages in second and it would waste lots of resources. WP has Akismet, a plugin which able to block spam comments automatically. WordPress also could be configured to block spammer before it even access your site. And yes, such features available in WordPress. We can use WordPress to design beautiful sites for any purposes such as Gaming blog, Portfolio, Gallery, e-Commerce shop, Social Forum and much more. WP is SEO-Friendly and have lots of awesome features to enhance its security and capabilities. By Choosing WordPress, you would not only save Bandwidth but also save time. Happy Developing WordPress. If configured properly, WordPress would run faster and better.